I love Cordylines and have always grown them in my garden. I'll pot up the seedlings, and pus larger juveniles in patio pots. I am especially fond of the normal common green varieties, and have quite a few planted in different beds. In a way they act like a garden growth chart - the first Cordylines I planted are now between three and four meters high. The general idea was to plant them in small groups, and I'm glad I did that in the general garden. 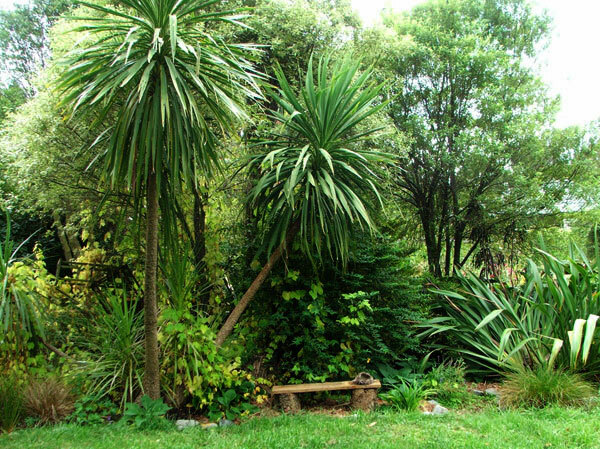 But recently I've planted a deliberate Cordyline Grove in a clearing in the Hump - it's an inhospitable piece of sandy garden, bordered by gum and pine trees. So far, so good! Not in Chippers or Shredders! Like Phormium (or flax) leaves, the old leaves from a cabbage tree are better burnt or left to rot slowly. Don't ever be tempted to put then in a chipper or a shredder! They can be dangerous for lawn mowers, too. 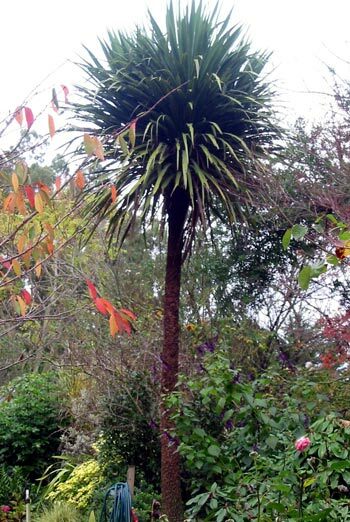 In New Zealand, Cordyline leaves are not accepted in the green waste at the council dumping stations - that says something about their non-compostable status. Many Cordylines start off being simply single, and then for no reason decide to produce many different trunks. And when a trunk is removed others can soon form at the base of the tree. So you can cut down a Cordyline, but expect its own personal replacements in the following years! A popular green variety that I grow has fatter leaves and is called 'Green Goddess'. It's slower growing than the species, and consequently there are less dead leaves to clean up - nice! I have several in the garden and in patio pots. I also have experiences of the stylish variegated Cordyline Albertii. My first plant provided free meals - the caterpillars which ate it munched the most expensive plant I have ever ever bought! I stripped off the offending leaves, the resulting plant looked rather peculiar with three stalks pointing up to the sky - not very stylish at all! Then it died - probably from stress at being eaten. Oops.